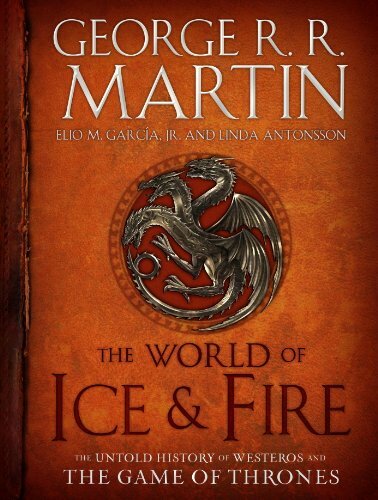 So, George R. R. Martin and his helpers Elio M. Garcia Jr. and Linda Antonsson wrote a book called "The World of Ice and Fire: The Untold History of Westeros and The Game Of Thrones." The book is an attempt to give serious fans a glimpse into the history of the Westeros from the beginning of its recorded history up to where the books begin. It is certainly not an attempt to write a "World of Ice and Fire Review" more an attempt to write a "World of Ice and Fire Companion Guide." The Long Night is referred to all of the time in the ASOIAF books and on the show Game of Thrones. It is the period of the last long winter in Westeros. Supposedly, the winter lasted so long and was so complete that there were people who were born and lived their entire lives without ever experiencing a Spring or Summer day. In fact, The World of Ice and Fire suggests that for some people in the North they lived their entire lives without ever seeing a sunny day. Older people in villages would often pretend they were going hunting when they were really leaving to die (so that the rest of their communities would have more food). It sounds like it was a heck of a great time all around. However, investigating the previous winter could be especially relevant because as we now know..."Winter is Coming" again in modern Westeros. So what stopped the last winter? * A "Hero" convinced a number of minor God's like the "Crab King" and the "Old Man of the River" to fight the winter (the Rhoynar tell this story). * A woman with a monkey's tail somehow caused the end of the winter. I have had no luck finding more context to this story, so if anyone knows more about this mythology please add a comment. * Azor Ahai hero of the followers of the lord of light R'hllor, brought an end to the winter using his flaming sword Lightbringer. Remember, Melissandre theorized that Stannis and now Jon Snow represents/ed the reincarnated Azor Ahai. This prophecy has versions in different cultures and includes the tale of the "Prince Who Was Promised." * A "Hero," who survived a long battle with the Others (White Walkers) sought out the Children of the Forest and joined forces with them and what would become the Brothers of the Nights Watch to defeat the Others in the Battle For The Dawn. It was this battle that inspired the building of the Wall and the Brothers of the Nights Watch. We know that the discovery of Dragonglass was critical to this and that it was the Children of the Forest who made the original Dragonglass (so this adds credence to what seems like a viable story). However, It is probably also important here to remember that it was the Children of the Forest who created the White Walkers in the first place (as a response to their war with the First Men as we learned at the end of Season 6 of Got). My guess is that the Azor Ahai story, The Night's Watch, and Dragonglass are going to be very important elements in turning the forces of winter back and winning the battle with the White Walkers. So, we know the Children of the Forest created the White Walkers but some other mythology exists as well. Some have even suggested that the original walkers were just a tribe of the First Men who became increasingly barbarous until they became the zombies that we know today. One other interesting thing from this chapter is that the Maester writing the book admits that Maester's cannot really predict the coming of winter or the changing of the seasons. Last time I talked about the "Age of Heroes" chapter. As you may know, I do recaps of Game of Thrones. You can read my recaps of Game of Thrones Season 6 by reading "The complete #OPS guide to Season 6 of #GameofThrones"
You can also read my series on the "Top Ten Problems" that I had with Season 6 of Game of Thrones. What are your theories about the Long Night?